The civil litigators at Glenn Robinson Cathey Memmer & Skaff PLC employ their firm’s resources to pursue the best outcome and earn your trust and confidence. Since 1991, our legal team has represented area residents, licensed professionals and Virginia-based government agencies. Whether you suffered injuries in a car crash, have been accused of negligence in an accident, or are facing the end of your marriage, we can provide you with legal guidance. We combine our experience at trial with insight into family laws and personal injury litigation for both plaintiffs and defendants. With tailored strategies and trial skills, we have advocated for clients from the pretrial level to appellate court. The attorneys at Glenn Robinson Cathey Memmer & Skaff PLC pride themselves on the years of experience working with the courts and attorneys across Virginia on both sides of the courtroom. With more than 25 years of experience representing both plaintiffs and defendants, we do not shy away from a trial and are not quick to settle cases if a judge’s or jury’s verdict can provide the better outcome for you. 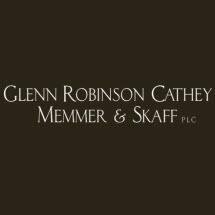 For more information on the attorneys at Glenn Robinson Cathey Memmer & Skaff PLC, schedule an initial consultation to discuss your case.